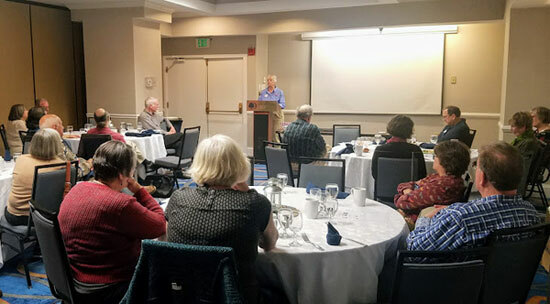 The Chesapeake Bay Pearson Sailing Association (CBPSA) had a fun and productive gathering of about 30 members at its annual club meeting on Sunday, March 25. The get-together took place at the Doubletree Hotel in Annapolis, MD, where members enjoyed a rich buffet spread of breakfast and lunch options. All four officer positions were filled in 2018 election: Jordan Snyder was elected as commodore, Jen Cook as vice-commodore, Anne Martin as treasurer and Ed Criscuolo as secretary/webmaster. The club store was open, and attendees purchased a variety of CBPSA gear. It was a real treat to have Priscilla Travis from the Chesapeake Area Professional Captains Association (CAPCA Speakers Bureau) give a delightful and insightful talk about solo sailing. Travis has extensive experience exploring the coasts of Northern Europe for many years. We learned much while enjoying Travis’ humorous stories. 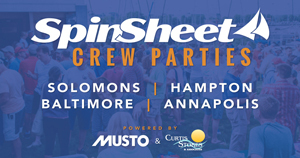 During the sailing season CBPSA holds monthly events. These consist of multiple raftups throughout the middle Chesapeake Bay, a for-fun race around Tilghman Island, and other social gatherings. At next month’s event (April 21), we will perform the ceremonial sock burning to celebrate the start of sailing season. We always welcome new club members to share sailing experiences, rendezvous, and stories. Learn more here.